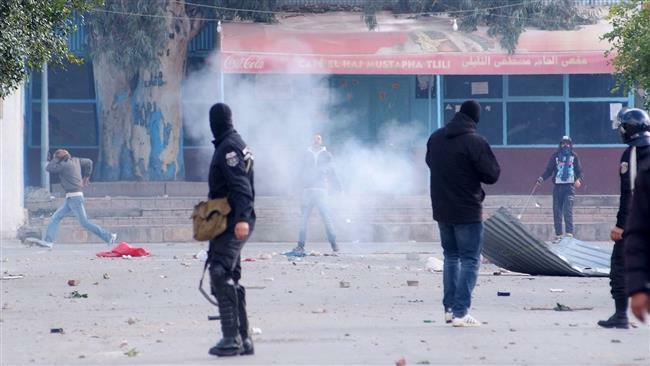 An officer is killed in a Tunisian town as police fire tear gas and water cannon to disperse hundreds of protesters in Kasserine, two days after an unemployed man committed suicide in the central city. The policeman was killed in Feriana during an attack by protesters demanding jobs, a spokesman for the Interior Ministry said. Meanwhile, protesters in Kasserine gathered outside local government offices for a second day to demand a solution to their town’s dire unemployment situation. According to witnesses, police used tear gas and water cannon and fired warning shots in the air. A nighttime curfew was imposed on the town on Tuesday. Regional health authority chief Abdelghani Chaabani said eight police officers were also injured in Kasserine as well as another 11 in nearby Thala on Wednesday. Tensions have run high in the town since Saturday, when 28-year-old Ridha Yahyaoui, killed himself after local authorities refused to accept his request for a post in the public sector. Yahyaoui climbed atop a power pole near the governor’s office and was electrocuted. To calm the protesters, the government of President Beji Caid Essebsi pledged it would seek to hire more than 6,000 young unemployed people from Kasserine, and start construction projects in the region. “We don’t have a magic wand to fix the situation in Kasserine straight away, but we are working on public investments that will start soon there,” said government spokesman Khaled Chaouket. Tunisia’s 2011 uprising broke out when a struggling young market vendor set himself alight to protest police harassment and unemployment in the central town of Sidi Bouzid in December 2010. His action triggered widespread street protests that brought down former president Zine El Abidine Ben Ali, who had been in power for over two decades, and set in motion an Arab Spring across the region.